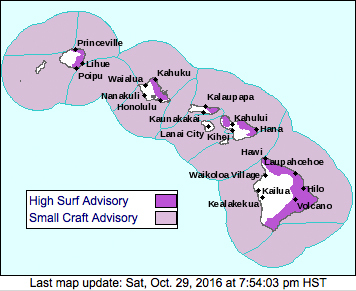 The National Weather Service in Honolulu has issued a high Surf Advisory for the north, south and east shores of Hawaii Island until 6 p.m. Sunday (Oct 30). Surf in the range of 6-8 feet is forecast. A Small Craft Advisory is also in effect for all Hawaiian waters until 6 p.m. Monday (Oct 31).